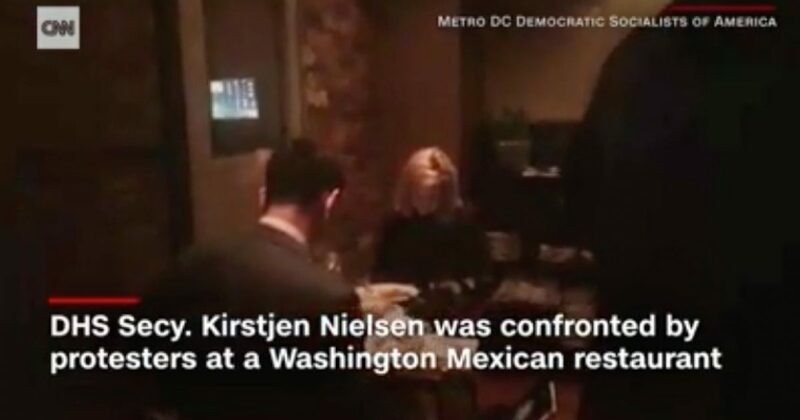 Left-wing activists forced Department of Homeland Security Secretary Kirstjen Nielsen from a D.C. restaurant. Nielsen was verbally abused and heckled by activists over the administration’s zero tolerance policy that results in migrant children separated from illegal alien parents at the U.S. Mexico border. Homeland Security Secretary Kirstjen Nielsen’s rough week got worse on Tuesday night after activists interrupted her dinner at a Washington D.C. Mexican restaurant and heckled her for her department’s controversial “zero tolerance” child separation immigration policy. While having a work dinner tonight, the Secretary and her staff heard from a small group of protestors who share her concern with our current immigration laws that have created a crisis on our southern border. Left-wing activists are going to extreme measures to intimidate individuals that oppose their political views. The increase in outrageous rhetoric and actions drowns out rational political debate making it much harder to resolve controversial political issues. Previous articleIllegal Aliens Fraudulently Use Children to Enter U.S.